Heifer International puts livestock and training in the hands of poverty stricken families and villages so that they can become self reliant. To learn more, go to www.heifer.org. (Don’t worry if you have a PC, the process with Movie Maker is basically the same). Help us create the largest virtual barbecue in the world while raising money for Heifer Int’l to end hunger! Have a barbecue party and video tape it. In your 1-3 minute video tell us what you are smoking or grilling, and what barbecue means to you. Upload your video to YouTube in response to this trailer. For every entry, we will donate $1 to Heifer, Int’l. Each winner will receive a signed copy of She-Smoke: A Backyard Barbecue Book. 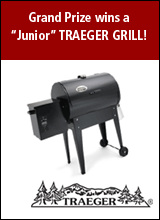 Grand Prize winner will receive a "Junior" Traeger grill ($399 value). A huge thanks to Traeger Wood Pellet Grills. Entrants agree to hold Julie Reinhardt harmless of any injury that occurs from creating their entry. Neither is Julie Reinhardt responsible for any fun or tasty barbecue that results from entering this contest.